Steven (Chicagoland, United States) on 16 February 2015 in Cityscape & Urban and Portfolio. The Chicago Cultural Center is a Chicago landmark building that houses the city's official reception venue where the Mayor has welcomed Presidents and royalty, diplomats and community leaders. The building is a testament to the foresight of Chicago's turn of the (20th) century cultural leadership. Originally the central library building, it was converted to an arts and culture center at the instigation of Commissioner of Cultural Affairs Lois Weisberg. This is also where the Tiffany dome and chandelier seen the last two days are showcased. 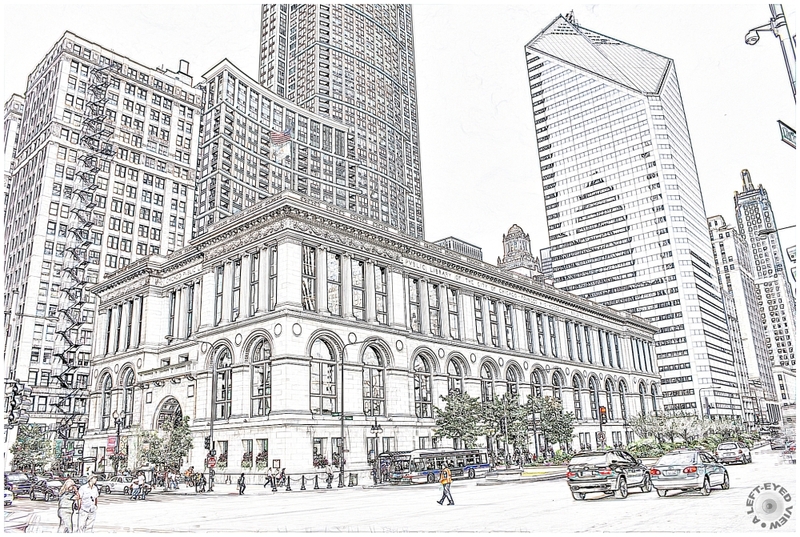 According to Crain's Chicago Business, the Chicago Cultural Center was the fifth most-visited cultural institution in the Chicago area in 2007, with 821,000 visitors. The building was designed by Boston architectural firm Shepley, Rutan and Coolidge for the city's central library and Grand Army of the Republic Museum, and completed in 1897 at a cost of nearly $2 million. It is organized as a 4-story north wing and a 5-story south wing, 104 feet tall, with 3-foot thick masonry walls faced with Bedford bluestone on a granite base, and designed in a generally neoclassical style with Romanesque revival elements. This becomes such a revealing choice of presentation - it works ! such beautiful angle, composition, graphics & treatment! A wonderful drawing! Great work with the processing. I really like this processing, Steven ... well done! I like this colored pencil effect. Beautiful image. What a magnificent building! I love the pencil drawing effect. Very interesting information. This building is really put to good use. That is very cool. I like those little blips of colour. Man, I've got to download this software - I love these pencil drawing renditions.